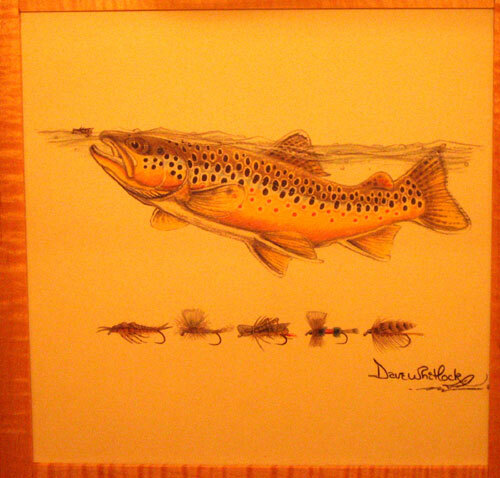 Hand made fly tying desks, benches and organizers. In addition to the desk shown, many of the pieces in my Office / Study Furniture section can be built to accommodate fly tying and materials storage. 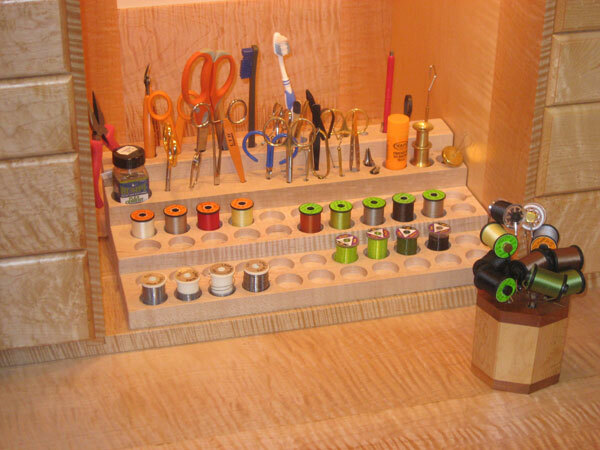 This fly tying bench is designed for a serious fly tyer with a ton of material and tool storage space and a large overhead bookshelf. 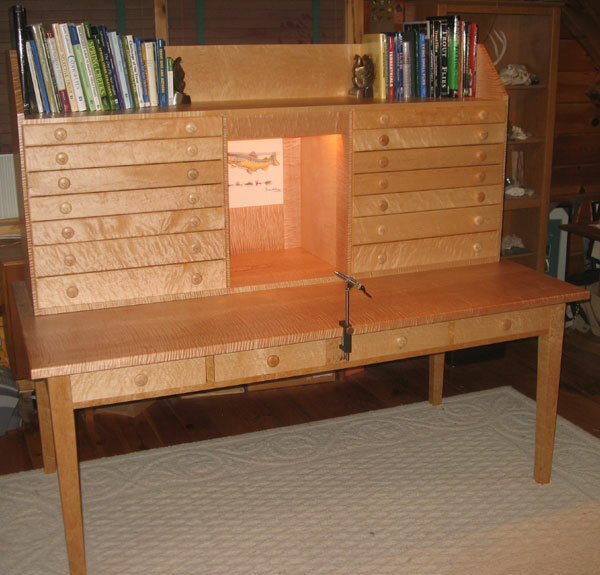 The desk is constructed from solid curly maple with birdseye maple drawer fronts. There are total of 18 drawers - four drawers in the desk and fourteen in the upper hutch section. The central part of the upper hutch features a deep storage well with a framed ceramic tile painting by Dave Whitlock - other pictures are available or the space can be custom designed to highlight artwork of your choice. The desk will accommodate both pedestal and C-clamp vises - with a large central drawer position to allow full access to the drawers without moving a C-clamp vise. All of the drawers feature handcut dovetail joints. The upper hutch section is constructed with handcut dovetail joints and sliding dovetails. The drawers in this desk feature a 3/16" thick hardboard bottom to maximize interior storage space, but solid hardwood bottoms from poplar or aromatic cedar are available. 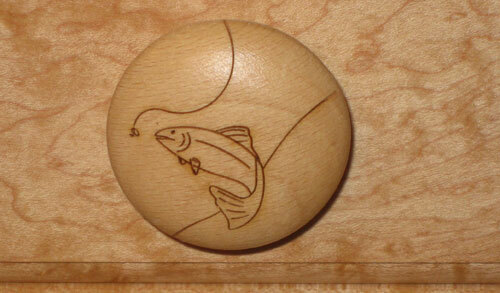 Custom knobs with laser etched trout and fly design. 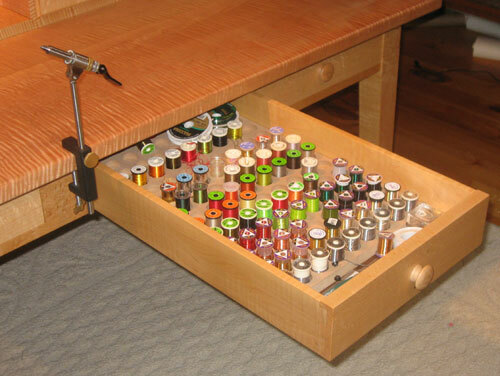 The desk can be accessorized with a custom tool storage tray or bobbin holder. Custom drawer interiors (spool holder, dividers, etc) are also available. As with all my pieces, the size, style, wood selection, and coloring can be customized to suit the customer's requirements. Solid curly maple construction - utilizing wide boards for full grain patterns. Top shelf is 17"deep to accommodate a number of books and tying tools. Central storage area for tool tray, dubbing dispensers, etc. Twin desk lamp fixture in illuminate central storage area and highlight picture or tile inlay. 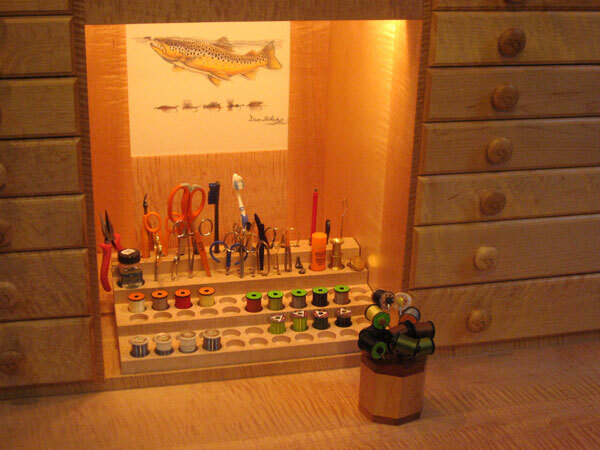 The fourteen upper drawers are approximately 24" wide x 17" deep and are graduated in height from 4" to 2.5"
Wooden Knobs have laser etched trout and fly design - other styles of hardware available.